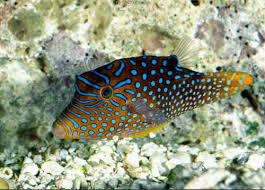 The Blue Spotted Puffer may also be called the Blue Dot Toby or Blue Dot Sharp-nosed Puffer. 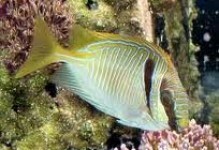 Members of theCanthigaster genus are called Sharp-nosed Puffers or Tobies. The Blue Spotted Puffer Canthigaster solandri and the Papuan Toby Puffer Canthigaster papua have very similar characteristics. The lack of orange coloration around the mouth of the Blue Spotted Puffer Canthigaster solandridistinguishes these two puffers. 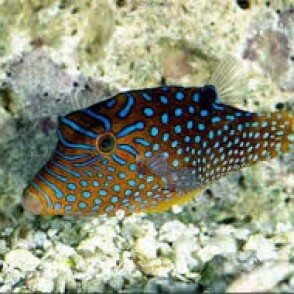 The Blue Spotted Puffer lacks pelvic fins, but has learned to use the pectoral fins to move about the aquarium. 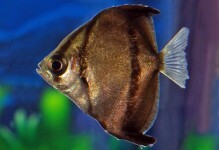 A 50 gallon or larger, fish-only aquarium is suitable. Its teeth are actually a fused beak-like structure. 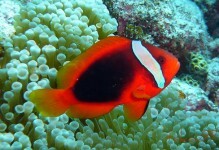 It may eat invertebrates found in a reef tank. It becomes alarmed when in a net, therefore, use a container to transfer it. 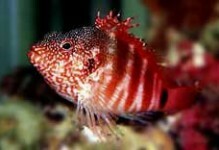 The diet of the Blue Spotted Puffer needs a varied diet of meaty foods including; squid, krill, clams, and hard shelled shrimp to help wear down their ever growing teeth.